A man has tweeted his thanks to a schoolgirl for saving him thousands of dollars -after she witnessed a bus hit his parked car and drive off. 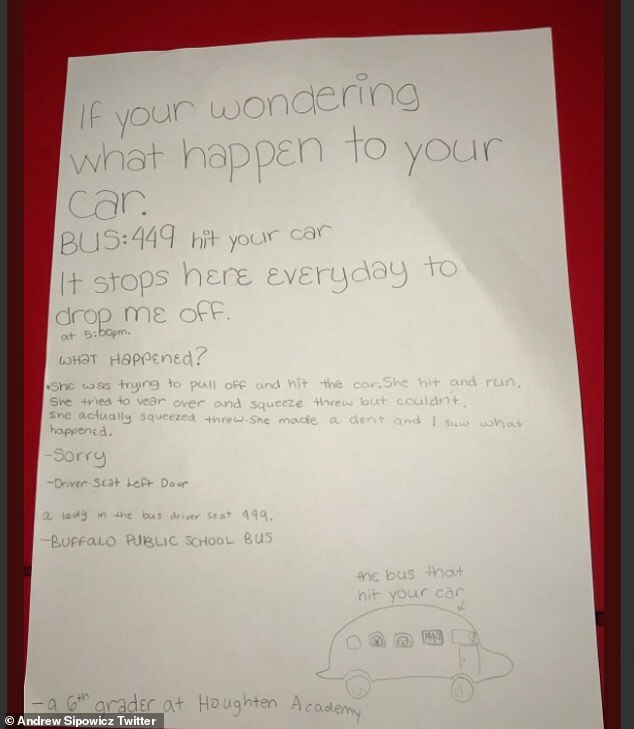 The anonymous pupil, who is in the sixth grade at Houghton Academy in Buffalo, New York, wrote down everything she'd seen in a note to the owner of the car and left it on the bonnet - complete with a helpful drawing of the bus. Andrew Sipowicz, a baseball coach from Orchard Park, New York, took to Twitter to share the detailed note left by the pupil. The sixth-grader had written a letter describing the moment her Buffalo public school bus had attempted to squeeze through a gap, denting the car in the process and then driving off. 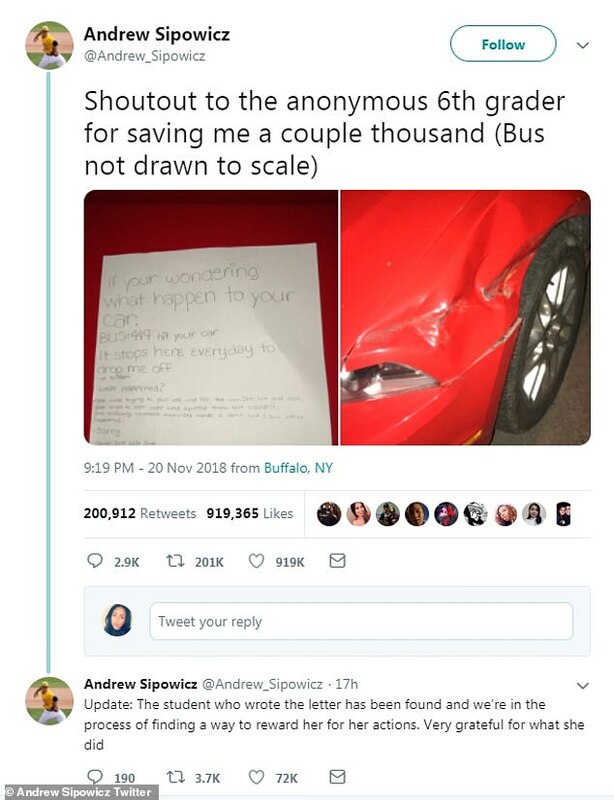 Taking to social media, Andrew wrote: 'Shoutout to the anonymous 6th grader for saving me a couple thousand (Bus not drawn to scale)', in a tweet that quickly went viral, racking up one million likes and retweets. He later updated his followers to say he'd identified the girl behind the note, and planned to 'reward her for her actions'. 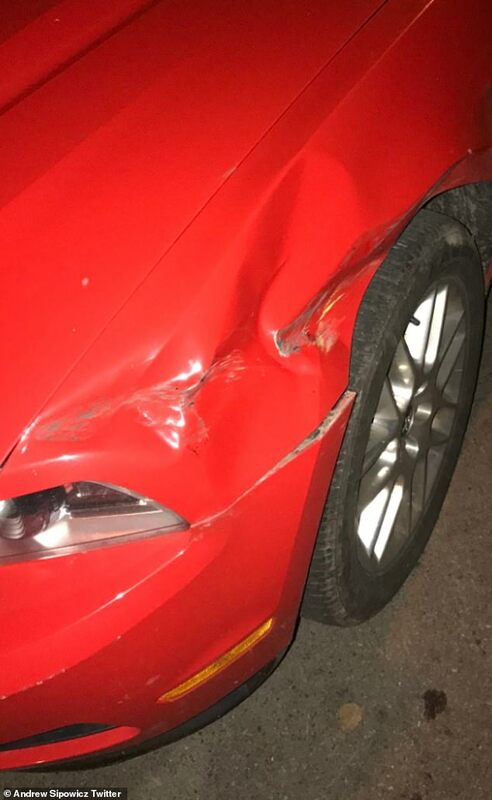 Alongside the tweet he shared a picture of his car, which appeared to be a red Mustang, with a sizable dent to the side. 'Bus: 449 hit your car. It stops here every day to drop me off at 5:00pm. What happened? She was trying to pull off and hit the car. She hit and run. She tried to veer over and squeeze through but couldn't. 'She actually squeezed through. She made a dent and I saw what happened. Sorry. Driver seat left door. A lady in the bus driver seat 449, Buffalo public school bus'. And going the extra mile, the student even shared a sketch of 'the bus that hit your car', along with a smiling bus driver and shocked students visible in the windows, before signing it with 'a sixth grader at Houghton Academy'. And Twitter quickly flooded the student's good deed with praise, remarking that she acted with 'honesty and intelligence'. And others shared similar experiences, writing: 'This, almost exact, thing happened to me! Except it wasn't a kid who left the note, it was a kind woman who saw my car get hit my the bus. They were able to track it down and the school bus company ended up paying for the damage!'. 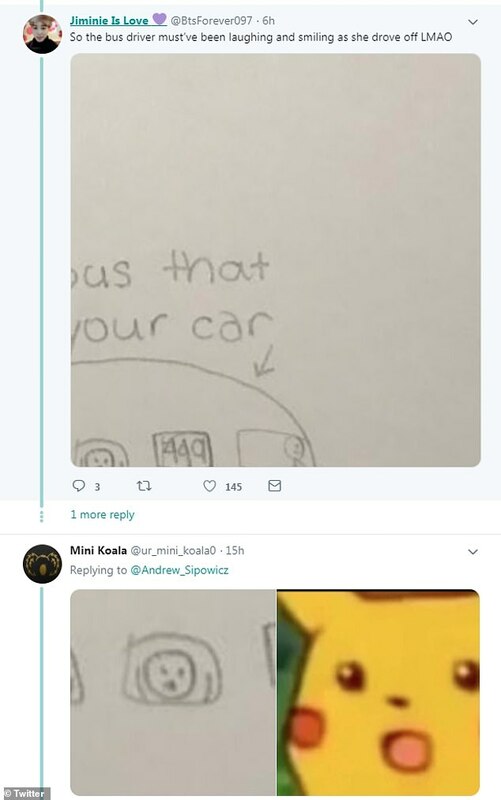 Pointing out the detail in the child's picture, one joked: 'The bus driver must've been laughing and smiling when she drove off! 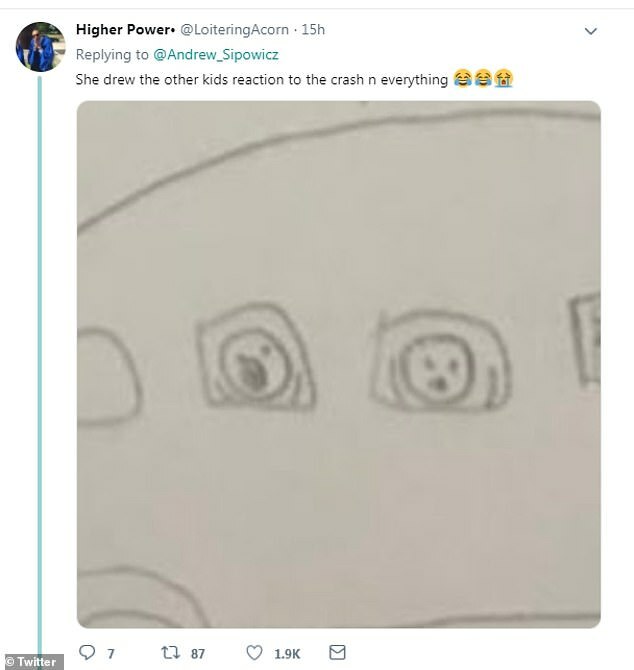 ', while another added: 'She drew the other kids' reactions to the crash and everything!'. Car owner Andrew later shared an update, writing: 'Update: The student who wrote the letter has been found and we're in the process of finding a way to reward her for her actions. Very grateful for what she did'. 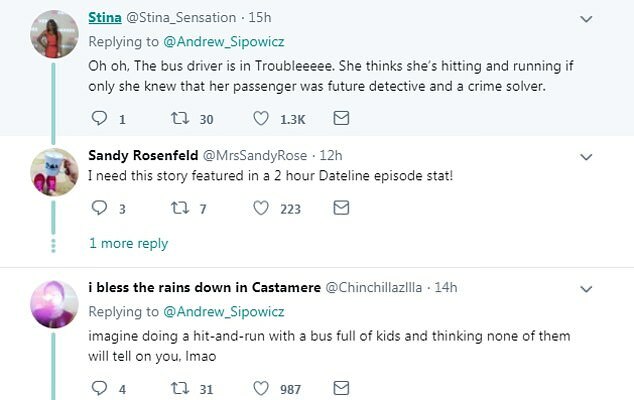 According to CNN, bus company, First Student, confirmed that representatives met with Sipowicz to initiate the insurance process. 'We will cover the full cost of the repair to his vehicle as well as a loaner while his car is in the shop,' the company told the news site.